Welcome to Zembrzycki Dairy Farm! 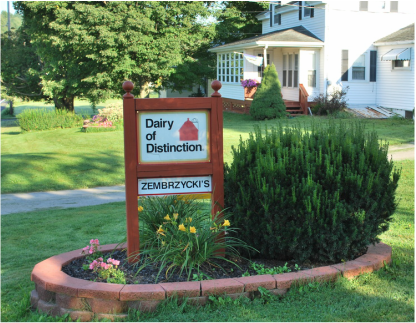 Zembrzycki Dairy Farm has been a family owned and operated farm since the mid 1900's when Bruno and Lottie Zembrzycki started the family farm. Since then their son Bernard Zembrzycki took over the farm along with his wife Rose. The farm is now currently owned and operated by the third generation farmers Bernard and Linda Zembrzycki. Bernard and Linda operate the dairy farm along with their four children and spouses; Amanda and husband Brad, Brian and wife Melissa, Bernard John and wife LeeAnna, and Katelyn. We have recently welcomed our fifth generation little farmers, Bradley and Henry, which are Amanda and Brad's children. We are a local dairy farm located in Northeast Pennsylvania in the small town of Herrick Center. We have a herd size of about 150 dairy cows. Our spacious farm land and our close family is what makes it possible to run our Dairy Farm. In 1990 Rose and Linda started our Produce Stand. It started off by just being a small table with a few fresh vegetables to now being a stand with about 25 different items for sale. We strive to provide the freshest produce for our customers. Our produce is picked fresh daily in the morning hours. This ensures that our customers are getting our best product. In 2009 Brian and Melissa started our Corn Maze. Our Corn Maze is five acres in size and offers a new challenging design each year. It also started off small but each year they are trying new things. As well as offering the maze we do offer campfire site rentals, photo op cut-outs, and a children's play area. Be sure to stop by this year to see what is new. Our Corn Maze and activities are fun for all ages! We are very proud to say that we are a local farming family that provides for our community. We would like to thank our loyal customers for your continuing support and business. Come by and visit us soon!